While the United States presidential election bitterly divided the American public, most Israelis were sanguine about the race. Both candidates – Donald Trump and Hillary Clinton – were keen to end eight years of icy mistrust between Barack Obama, the outgoing president, and Benjamin Netanyahu. The Israeli prime minister should – at least on paper – be happier with Trump. Netanyahu, elected four times, has always faced off with Democratic incumbents. Now he has not only a right-wing Republican in the White House but a Republican-dominated Congress too. Standing guard over the relationship will be Sheldon Adelson, a US casino magnate who is Netanyahu’s most vocal supporter. It will not be lost on Trump that the billionaire is one of the Republican Party’s main financiers. Netanyahu was among the first to congratulate Trump by phone. The US president-elect reciprocated by inviting him for talks “at the first opportunity”. And yet Netanyahu is reported to be anxious about a Trump White House. Why? It is certainly not because of Trump’s stated policies on the Israel-Palestine conflict. He has backed moving the American embassy from Tel Aviv to Jerusalem – a move that, if implemented, would make the US the first western state to recognise the city as Israel’s capital. It would effectively rubber-stamp Israel’s illegal annexation of East Jerusalem, the expected capital of a Palestinian state. Previous Republican candidates have made the same promise, but Trump looks like the first who might carry it through. A nervous Palestinian leadership warned at the weekend they would “make life miserable” for him if he did. A Trump policy statement issued just before the election could have been written by Netanyahu himself. It dismissed a two-state solution as “impossible”, blaming the Palestinian leadership for rewarding terrorism and educating children in “hatred of Israel and Jews”. It suggested that Israel would have a free hand to expand the settlements. There were hints too that US military aid might be increased above the record $38 billion over 10 years recently agreed by Obama. And the statement proposed a crackdown on all boycott activities, even those targeting settlements. “The false notion that Israel is an occupier should be rejected,” it concluded. So why the nerves in Tel Aviv? However hawkish Netanyahu appears to outsiders, he is relatively moderate compared to the rest of his Likud party and his government coalition partners. The prime minister has won favour at home by presenting himself as an embattled leader, but one best placed to look out for Israel’s interests against a hostile White House. Now with the battlefield gone, Netanyahu’s armour risks making him look both clumsy and surplus to requirements. The Israeli prime minister could find himself outflanked by Bennett if the Trump administration approves settler demands to annex most or all of the West Bank. Netanyahu’s realisation of his Greater Israel dream may prove pyrrhic. Israel’s complete takeover of the West Bank could trigger an irreversible crisis with Europe; the collapse of the Palestinian Authority, forcing the military and financial burden of the occupation back on to Israel; and a full-blown intifada from Palestinians, battering Netanyahu’s security credentials. The creation of a Greater Israel could also damage Israel by reframing the Palestinian struggle as a fight for equal rights in a single state. Comparisons with earlier struggles, against South African apartheid and Jim Crow in the US deep south, would be hard to counter. But Netanyahu has an additional reason to fear an imminent Trump presidency. There were few US politicians Netanyahu had a better measure of than Hillary Clinton. He knew her Middle East policy positions inside out and had spent years dealing with her closest advisers. Trump, by contrast, is not only an unknown quantity on foreign policy but notoriously mercurial. His oft-stated isolationist impulses and his apparent desire to mend fences with Russia’s Vladimir Putin could have unpredictable implications for the Middle East and Israel. He might tear up last year’s nuclear accord with Iran, as Netanyahu hopes, but he might just as equally disengage from the region, giving more leeway to Iran and Russia. The effect on the international inspections regime in Iran or the proxy wars raging in Israel’s backyard, in Syria and elsewhere, would be hard to predict. In short, Trump could kill Netanyahu with kindness, turn Israel into a pariah state in western capitals and leave it exposed strategically. In addition, becoming the poster child of a controversial and possibly short-lived Trump presidency could rapidly transform Israel into a deeply divisive issue in US politics. 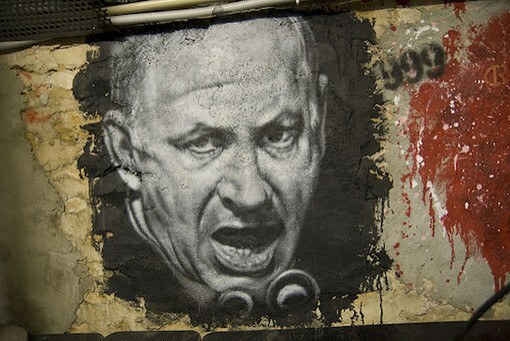 The adage – be careful what you wish for – may yet come to haunt Netanyahu.